Intro: On a visit to Columbia University, author and scholar Sujatha Fernandes explored the effects of manipulating storytelling in order to achieve desired results. In this article, OHMA student Renaldo McClinton will discuss the advantages and disadvantages of curating stories through social media and other digital platforms. On October 4th, 2018, Professor Sujatha Fernandes visited Columbia University’s campus and proceeded to give a brilliant presentation on the ability of oral history to create powerful change in marginalized communities. In her work Curated Stories: The Uses and Misuses of Storytelling, Fernandes considers the role that curated storytelling has had in the improvement of domestic worker’s conditions and the passing of the New York Domestic Workers’ Bill of Rights. Ultimately, the use of storytelling gave domestic workers the opportunity to shape the narrative lens from their own perspective and for their own political purpose. But the kind of curated storytelling used in the campaign has its limits. There is a particular case in the book that questions the uses and misuses of curated storytelling. In 2009, a Trinidadian Domestic Workers Union member named Patricia Francois filed a lawsuit against her employer after being assaulted. Her story garnered a significant amount of attention and became an integral part of the conversation that surrounded the proposed bill at that time. On June 6, 2010, an article written by journalist Jennifer Gonnerman was published by New York Magazine detailing Francois’ encounter. Francois’ story was heavily curated to gain supporters, and a few minor details were omitted as to encourage sympathy. In Curated Stories: The Uses and Misuses of Storytelling, Fernandes is concerned that curated storytelling can potentially restrict marginalized groups’ ability to create actual social change. Fernandes discusses how assembling narratives can camouflage underlying issues that need to be addressed. She makes a very compelling argument that curated narratives can be damaging, but can they beneficial as well? In this technologically advanced age, we find ourselves curating narratives on a daily basis. Social media has become a staple in most of our lives, and it’s outmoded to operate without at least one social media account. True, the almost unrestricted dissemination of information via the internet has led to an increase in false truths and opinions toted as fact. Photoshop has sparked a debate over authenticity because of its ability to manipulate the context and content of images. It is often difficult to decipher when something real or fake, and this can be dangerous. Instagram has leaned into the controversy, and has built its platform on allowing consumers to alter their facial features with filters. These digital enhancements can be misleading and dishonest depending on how heavily users choose to curate themselves. However, can curated stories create a platform that contributes to facilitating socio-political change? Social media companies are increasingly invested in allowing consumers to curate their own stories. Long gone are the days of conglomerate publications monopolizing information. Polls show that periodical subscriptions have dropped drastically over the last decade. Also, television news viewership has been on a steady decline. Much of this is due to user friendly storytelling medias such as Twitter. Twitter has also become increasingly vital in giving agency to muted voices in oppressed communities. In fact, Twitter is often the most immediate and reliable source of current events for the general public. Users can post content that goes viral to a large number of people instantaneously. In fact, this is the very milieu that shot the Black Lives Matter organization into prominence. Many news stations refused to report on the protests in Ferguson after the murder of Michael Brown in 2014 by local law enforcement. 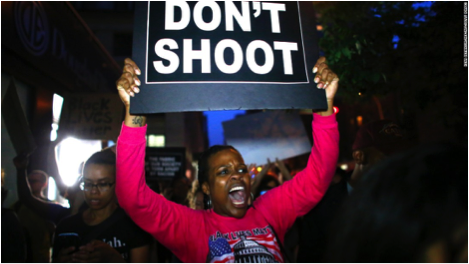 However, communities were exposed to the events in Ferguson by way of guerilla oral history video documentation and first-hand accounts that were uploaded to social media servers. Journalists get most of their material from interviews with eye witnesses, so algorithms like Twitter have simply taken the middle man out of the process of creating history. The future of curated storytelling is manifesting power in the everyday person. I can’t think of anything more powerful. Artists and politicians are carefully curating their identities to online audiences. I have witnessed an artist such as Beyonce, who has a repertoire of 120 million followers, create a comprehensive shift in culture and bring awareness to global issues with a single post, ultimately creating instantaneous change. Although Sujatha Fernandes’ concerns are warranted, I think that the benefits of curated storytelling outweigh the drawbacks. Renaldo McClinton is an oral history graduate student at Columbia University. He is currently conducting research on Black masculinity and its impact on the Black community. Areas of interest include African identities, historical narratives, and classical theatre.